I know in interview(tho this was from Scandal), Martin did say he enjoyed getting to thump Benedict! He said the he couldn't pass up the opportunity to almost thump Benedict. And that post was funny! I'm with SusiGo on this one: In the choice between John being an abuser all on his own (even with PTSD) and Euros making him do it, I prefer Euros's influence. Because it was abuse, and on an escalated level from what we've seen before from John. Doubly shocking because it was not only abuse of a "friend", but also a doctor abusing a sick person (I find it interesting that both CS and SH ask "what kind of doctor are you?"). So I'm constantly torn between ignoring it all (hey, it's only tv), thinking John and Sherlock deserve each other (let's just hope they stay away from "normal" people), and thinking they should get as fast and far away from each other as possible - and stay away, for both their mental and physical health. In real life, I would go with your last option. In real life, I would have John run away from Sherlock seasons ago, because Sherlock behaved horribly towards him again and again. 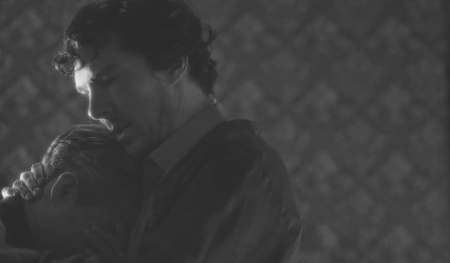 And if by TLD they were still together, I would have Sherlock run away from John and his violence. However, as I mention in another thread, this is TV reality. And Sherlock is not real, never has been, not from the very first episode. And in the TV reality they have made, John's violence makes sense. (Not saying I support it, only that I understand where it comes from). As Martin himself says - it's a combination of an accumulation of anger towards Sherlock that he has swallowed down for years, and using Sherlock as a scape goat for Mary's death because he can't face his own guilt by that point. Later in that episode we see John own up to his own guilt, and for the first time in the entire series, allow himself to feel, to express those feelings and to receive comfort - a huge sign of trust and vulnerability which Sherlock rightfully sees for the big step that it is from John. So to me, TV reality doesn't mean I ignore it, but that I understand it as a concept of the series itself. Two flawed characters who have both hurt each other and others in their process of being better human beings. Amazing series. There's just one problem with the "it's only tv approach": Too many people "learn" from tv and copy things they've seen on screen. Tv influences reality (the first black US president was on tv - not a coincidence, in my opinion)? And I'm really scared to think what people take away from Sherlock - the show that's infamous for actions having no consequences... Btw. has there ever been a clear statement from writers or actors that of course in real life domestic abuse is completely unacceptable? I see absolutely no need for them to make such a statement. - Should they make a statement that it's not ok to perform fear experiments on your PTSD army veteran friend? - Should they make a statement that you shouldn't use drugs? - Should they make a statement that you should not be exeptionally rude towards someone who has a crush on you? - Should they make a statement that you should not steal from NSY DIs? If people "learn" from Sherlock to do bad things, well, then they have some huge issues to begin with and that is neither the fault nor the responsibility of the actors or the writers. You only need to have a single shred of human perception to understand that John's violence was not glorifed in the series. For those who lack that understanding, Sherlock would be the least of their (and thus: our) worries. While I do think that things don't exist in a vacuum, that what we see in film and TV does reflect where are culture is at on various topics and that it can shape people's thoughts, I also don't think that John's violence is glorified in the series, either, nor is Sherlock's drug use, or moments when Sherlock is rude to Molly. Well, I think it is not so much about glorification. Some people find it problematic that such things are seemingly accepted without repercussions. We do not see John apologising for hitting Sherlock. And in the long 221b scene after it is not mentioned at all. Sherlock's injured face is here the elephant in the room, clearly visible but never alluded to. I think this is what may be regarded as problematic. Same with Mary's shot. We get a short mention before she dies but nothing more. The way such quite unforgivable acts are treated in the show seems to be the problem and not so much the acts themselves. I never thought of them as things that went unaddressed. I think in a visual medium, like film/television, there are a lot of different ways of dealing with such things. There are things that happen between, for example, John beating up Sherlock in the morgue and the "It is what it is scene" where they have some sort of reconciliation. I don't think it is until the latter scene that things are completely resolved, from what I remember from watching the episode. I agree with Yitzock. I do understand that some people find that problematic, but it's not really unresolved for me. The apology is not spoken in direct words, but i feel the intent is there in that scene, in between the lines. ....You only need to have a single shred of human perception to understand that John's violence was not glorifed in the series. For those who lack that understanding, Sherlock would be the least of their (and thus: our) worries. Then you should start worrying (I do as well - about the lack of recognition of the problem)! 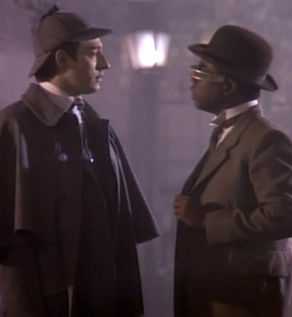 For I have seen John's violence in the series being treated as either a good thing: When he murdered the cabbie, whom he knew NOTHING about (in the aired episode Sherlock never says that a cabbie is a murderer, and the cabbie does not drug and abduct Sherlock), Sherlock mentions a "strong moral principle" to Lestrade. Or simply a joke: When John attacks Sherlock in the various restaurants in TEH, when he threatens him in HLV. In both cases without consequence. When did the show ever show John's violence as problematic? The attack in TLD is glossed over not only in the series, but also in the DVD extras: Martin Freeman calls John's attack "a fight" and says filming it was "quite good fun" (unlike some other fights he's done) (https://arianedevere.dreamwidth.org/65574.html - also for the next quote). And in the extra to TFP Freeman says "It’s one of the things I really like about John, is that he’s a thoroughly decent man. He’s a very, very brave, decent, loyal man and, yeah, I like that about him." WTF??? What do they have to do or say for you to consider it "glorification"? Another point to consider: Maybe I'm not watching enough tv, but I can't remember any recent show (or film) where a "good" person could get away with racist, antisemitic, sexist or homophobic statements and/or actions without consequences (actually, I don't even remember anything with consequences...). But brutality is perfectly okay????? And have you ever wondered why minorities care about representation? If that is how you feel about how the events were portrayed in the show, then that is fine. Everyone has their own interpretation. It's what makes film studies interesting. But I don't think we can necessarily say that Martin's experience of performing in the scenes is the same as what the intention was for the writing of the show or the overall message as a whole that is given through the show itself. Actors enjoy being able to let loose. They like to perform highs and lows of emotion. Actors talk about villains being fun to play. That doesn't mean that they don't think the actions are wrong, but they like the challenges that those kinds of roles and moments provide. It doesn't mean they think it would be a good thing to do in real life. I think part of the enjoyment is that you can let those emotions out without actually seriously hurting anyone. I don't think Eurus made him do it, I think he did it on his own accord. As for the rest, I view all of it very differently. I have no problem understanding Martin when he says it was fun to film - of course it was. I am actually quite unable to comprehend that someone can not understand that this does not mean he endorse or enjoy violent acts in itself. Well, but if you look at the scene John's behaviour is never addressed. He apologises for betraying Mary, not for hitting Sherlock. He is comforted by Sherlock and accepts the comfort. Do not get me wrong, the scene is beautifully played, but it is not about John's behaviour towards Sherlock, but towards Mary. Of course one may believe that it is implied but one sentence, just one little sentence, would have been nice. 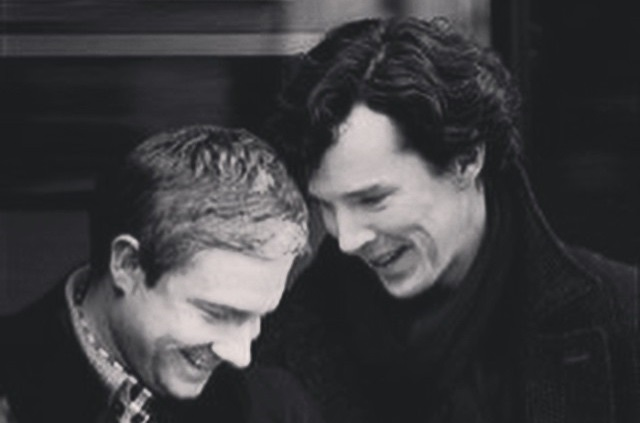 For me, here Sherlock is the one with the big heart, not John. And Sherlock survives by sheer coincidence, not because John was so keen on saving him. I think there is no way of denying that the John we see in S4 is very different from the one we knew before. A man in grief, facing his demons. I agree, he is very different. A very interesting character development, I think. And I think they were both being great (or as Lestrade would say: good) in that scene, in different ways. I think that scene in particular shows how far they have come, the both of them.